This fabulous casserole has the most wonderful flavor. 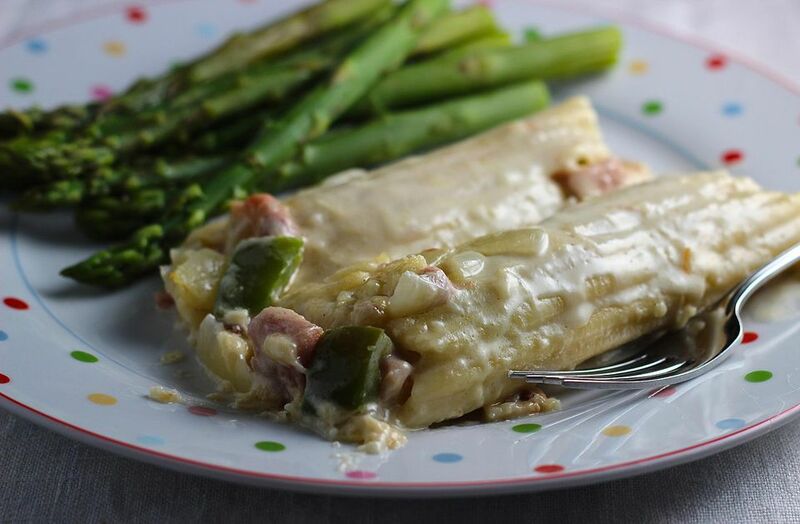 Tender ham is mixed with a white sauce and sauteed vegetables and melted cheese, then stuffed into manicotti pasta. The whole thing is enveloped in more sauce and cheese and baked until bubbly and brown. This is one of the best ways to use leftover ham from Easter or Christmas dinner. It freezes really well too, so make a couple of batches this holiday season. All you need to add to this recipe to make a complete dinner is a green salad tossed with mushrooms and grape tomatoes and a simple vinaigrette salad dressing, a glass of white wine, and some brownies for dessert. ﻿Cook the manicotti as directed on the package. Drain the pasta, rinse in cool water, drain again, and set aside. Meanwhile, in a large saucepan, cook the onion, garlic, and green bell pepper in the butter or olive oil over medium heat until tender, about 5 to 6 minutes. Add the ham to the skillet and set aside to cool for 10 minutes. Stir in 1/3 cup Parmesan cheese. In another heavy saucepan, combine the Alfredo sauce and milk over medium heat until it starts to steam, about 4 to 5 minutes. Stir in the Swiss cheese until melted and remove from the heat. Mix 1/2 cup of the cheese sauce with the ham mixture. Fill the cooked and cooled manicotti shells with the ham mixture (your fingers work best for this; it's messy, but most efficient). Spread about 1/2 cup of the cheese sauce in a greased 13-by-9-inch glass baking dish and arrange the filled manicotti shells over the sauce. If there is any leftover stuffing, just sprinkle it over the filled shells. Pour the remaining cheese sauce over the filled manicotti. At this point, the casserole can be cooled in the refrigerator, then wrapped and frozen up to 3 months. To thaw and reheat, thaw the casserole overnight in the refrigerator, then uncover, sprinkle with 1/2 cup Parmesan cheese, and bake at 350 F for 40 to 50 minutes. If you are not freezing the casserole, sprinkle with 1/2 cup Parmesan cheese and bake at 350°F for 30 to 35 minutes until bubbly and the cheese starts to brown.